People's live are the future of the Earth! Time to click that Gogo Brace and equip yourself as Shout! 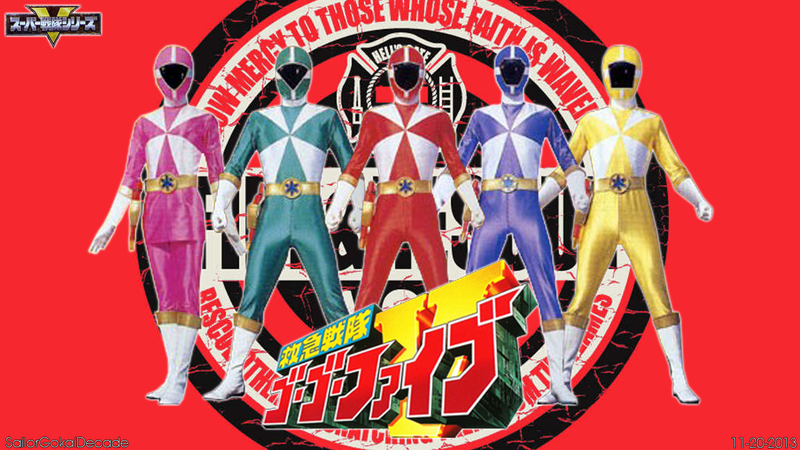 Factory announces that they will be releasing the complete series of 1999's Kyukyu Sentai GoGo V! Kyukyu Sentai Gogo V is about a team of siblings who are all members of different rescue forces destined to protect the earth against the calamity bringing forces of Psyma! The series ran from February 21, 1999 till February 6, 2000 and was adapted into Power Rangers Lightspeed Rescue. Shout! Factory's Kyukyu Sentai GoGo V The Complete Series DVD is scheduled to be released this April 24th and will be priced at $59.97 with pre-orders now up at Amazon. Such an underrated show. The writers knew how to make characters relatable and how to give all of them screentime, different from recent years of red kingdom. That means there will be 3 months between Gingaman and GoGoV. With that schedule, could we possibly get 4 series, this year???? Unfortunately most of the fansubbers are from the US, and since the series is officially licensed means fansubbers are no longer able to sub it because they had to obey the US laws of copyright licensing. You may ask to any fansubbers out there why they have to stripping off the links once the series is licensed. Save the world! Take your time! Kyukyu Sentai SlowSlow Faibu! Seriously, I love this series but I still feel they take their time to do EVERYTHING. Hopefully more will appreciate it.